Decompose: Choose a wavelet, choose a level N. Compute the wavelet decomposition of the signal at level N.
Threshold detail coefficients: For each level from 1 to N, a threshold is selected and hard thresholding is applied to the detail coefficients. 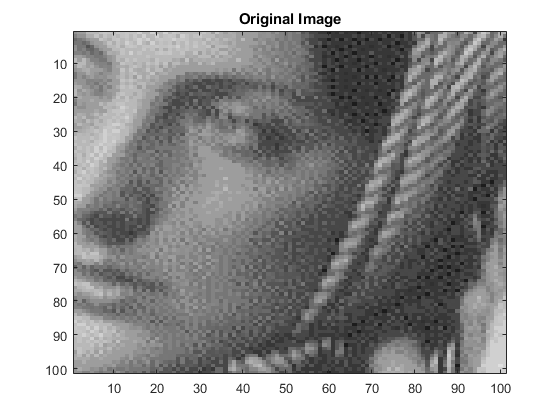 Reconstruct: Compute wavelet reconstruction using the original approximation coefficients of level N and the modified detail coefficients of levels from 1 to N.
The first consists of taking the wavelet expansion of the signal and keeping the largest absolute value coefficients. In this case, you can set a global threshold, a compression performance, or a relative square norm recovery performance. Thus, only a single parameter needs to be selected. The second approach consists of applying visually determined level-dependent thresholds. 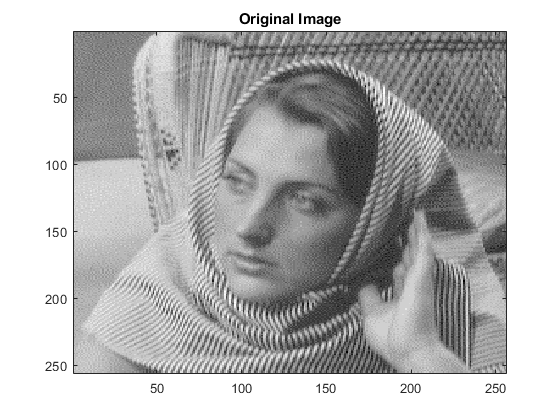 Let us examine a real-life example of compression for a given and unoptimized wavelet choice, to produce a nearly complete square norm recovery for an image. load woman;              % Load original image. The compression features of a given wavelet basis are primarily linked to the relative scarceness of the wavelet domain representation for the signal. The notion behind compression is based on the concept that the regular signal component can be accurately approximated using the following elements: a small number of approximation coefficients (at a suitably chosen level) and some of the detail coefficients. [c l] = wavedec2(x,n,w); % Multilevel 2-D wavelet decomposition. In this first method, the WDENCMP function performs a compression process from the wavelet decomposition structure [c,l] of the image. thr_h = [17 18];    % Horizontal thresholds. thr_d = [19 20];    % Diagonal thresholds. thr_v = [21 22];    % Vertical thresholds. In this second example, notice that the WDENCMP function performs a compression process from the image x. By using level-dependent thresholding, the density of the wavelet decomposition was reduced by 3% while improving the L2-norm recovery by 3%. If the wavelet representation is too dense, similar strategies can be used in the wavelet packet framework to obtain a sparser representation. You can then determine the best decomposition with respect to a suitably selected entropy-like criterion, which corresponds to the selected purpose (de-noising or compression).